UK Games Expo 2: Electric Boogaloo. I need to workshop this title, bear with me. And like any good sequel, we re-tread similar ground as last time. But better, with a bigger budget and with a new character. Mike O’Raw joined Ben MacKinnon and I as we fought and survived UK Games Expo 2018. Gone were our bumpkinship expectations of last year; we were ready for the third biggest gaming convention in the world. We had a plan for 4 days’ worth of coverage: Thursday through to Sunday. And then the car broke down an hour and half into our journey south from Glasgow. And so, we three peely-wally Scotsmen stood and baked in the summer sun for three hours while the nice man from the AA worked elbow deep in Ben’s car. So we missed the start of the press preview on Thursday night. However, We did arrive in time to meet John Lund as well as Oliver and Mel Hulme of SpiderMind Games. 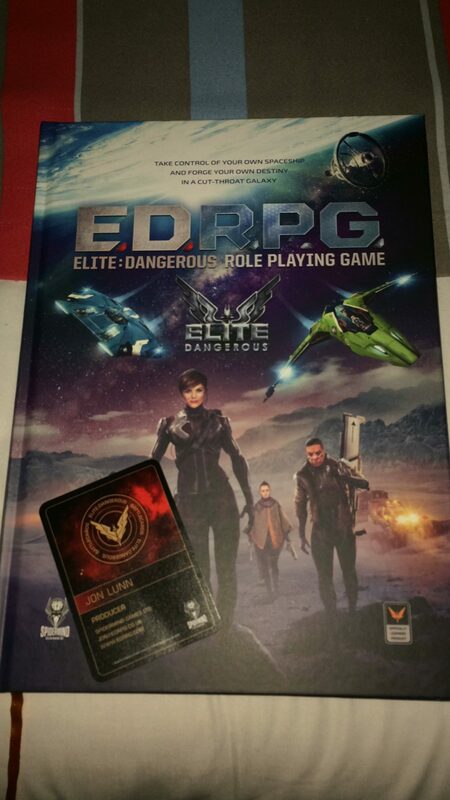 Elite Dangerous occupies a space in Ben’s mind next to the bit that dictates his preferences for Whisky and stores Gaelic swear words. That is to say that it is part of his very being. The video game motivated his inquiries about the tabletop RPG that SpiderMind produced. It has gripped him such that it is the first (and likely not the last) game he GM’d. I therefore invite you to imagine the look on his face when they showcased the card game at their stall. It was marvellous. And remember: I say that as someone who attended his wedding. I chatted to Oliver and Mel about the second print of the RPG they had with them as Ben siphoned as much information as he could from John. I had my back turned at one stage, but I fear an apparatus was used. John talked a little about the Starter Pack and how it gets you up and running. He also mentioned that there will be ‘Seasonal Packs’ which suggests the production/release model for the game. We scuttled to our hotel to eat altogether far too much food, continue to sweat buckets in the interminable heat and plan out the first day. UK Games Expo 2: Dream Warriors. Dreamy Warriors? Before the event opened on Friday morning, I went for a wander around Hall 2. 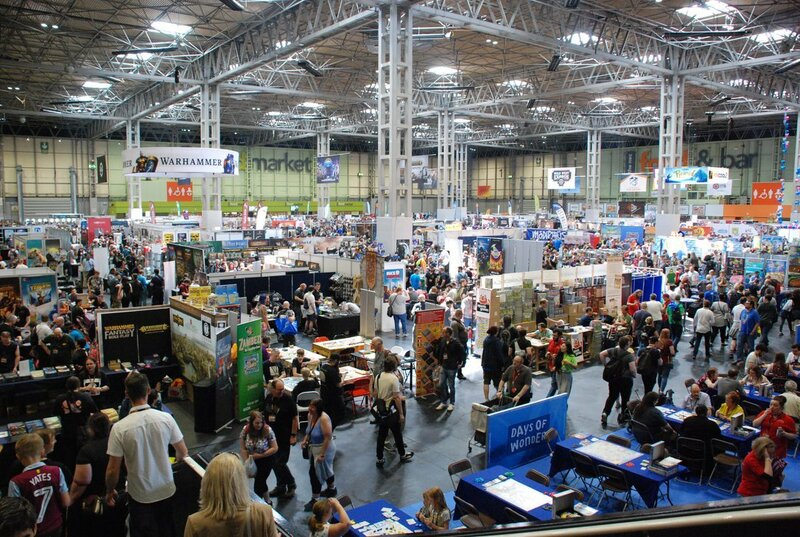 They’ve reconfigured the layout for the UK Games Expo for 2018. In 2017, the day event was in two separate halls at opposite sides of the Conference Centre. The Developer and Trader Hall were at the front door with the tournaments consigned to oblivion at the back of the centre in Hall 3. This year, the UK Games Expo was in two co-joined halls and movement flowed via a set of connecting stairs. It has a more spacious feel – that’s not to say there’s less in it. There was more room to manoeuvre through the event. Hall 1 still held the Trader and Developer stalls, and it had a more joined-up feel this year. Fantasy Flight returned to host the European Championships for: Star Wars X-Wing Miniatures, Legend of the Seven Rings, the Netrunner and Game of Thrones card games. Sections were also set up for CCG’s and Wargaming. Plenty of people had settled down for games before the event started. A large queue had already formed at both the Bring and Buy and the Board Games Library manned by the team from Thirsty Meeples. The adventure continues on page 2!